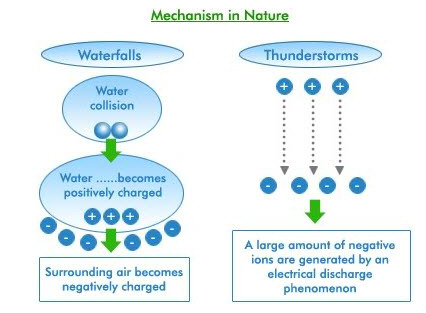 Ions are charged particles in the air that are formed in nature when enough energy acts upon a molecule such as carbon dioxide, oxygen, water or nitrogen to eject an electron from the molecule leaving a positively charged Ion. The displaced electron attaches itself to a nearby molecule, which then becomes a negatively charged Ion. It is the negative ion of oxygen that affects us the most. Remember that feeling you’ve experienced near a waterfall or high in the mountains? Those are two places that thousand of negative ions occur. They create an effect on human biochemistry. The normal Ion count in fresh country air is 2,000 to 4,000 negative Ions per cubic centimeter (about the size of a sugar cube). At Yosemite Falls, you’ll experience over 100,000 negative Ions per cubic centimeter; on the other hand, the level is far below 100 per cubic centimeter on the Los Angeles freeways during rush hour.